In one of my previous posts Growing Irrelevance of news channels I had talked about how the news channels should innovate themselves or face inevitable redundancy in face of growing use of online media. 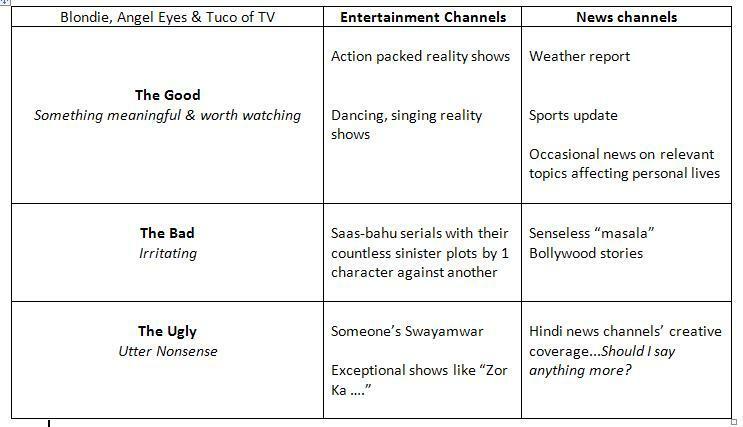 Here, in my second part of Good, Bad & Ugly I will try to classify the entertainment & news channels of Indian origin, as per their value creating abilities..
All of us like to watch TV serials & shows based out of foreign countries..Our channels have simply tried to copy them & reproduce the Indian version..The innovative ones , have unfortunately fallen into the “Bad” or “Ugly” category more often than not. Time has come for creative heads of our channels to bring up something new & “Good” for the Indian audiences, so that they neither become irrelevant nor unpopular in the face of changing audience preferences..